The 6-strands can be separated and use as few or as many strands together as you choose to create the right size thread for your stitching project. ***Limited Edtion*** This lovely green has flecks of golds and hints of blue...the lovely Aspidistra plant is the perfect greenery to pair with roses! ***Limited Edtion*** This lovely green has lovely blues and teals...the lovely Blue Hosta leaves are the perfect greenery to pair with roses! 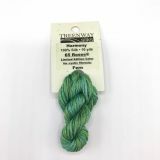 ***Limited Edtion*** This lovely, dominately green, thread has flecks of all the colors in an Autumn Rose Garden...some late blooming red roses, foliage turning gold and bronze, and hints of blue sky here and there. The perfect greenery! ***Limited Edtion*** Bright Pinks and deep blue-violets, with a bit of pale grey--a fun colorway!